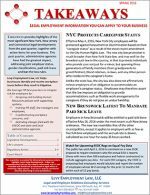 New York City protects employees with any caregiver responsibilities, while federal, state and city government agencies expand employee rights in interpreting joint-employment status, interpreting paid sick leave and ban-the-box laws, and eliminating gender distinctions in business policies and practices. Also covered are recent NLRB and Second Circuit decisions. Life’s Lessons column highlights the reasons for all employers to update their employee handbooks and conduct workplace training on a more frequent basis.